This post contains affiliate links. If you click on the links below and make a purchase, I may receive a small compensation to help me finance this site and keep coming up with awesome tutorials and tips! There’s no cost to you, and I only ever include links to companies and products that I trust and work with on a regular basis. 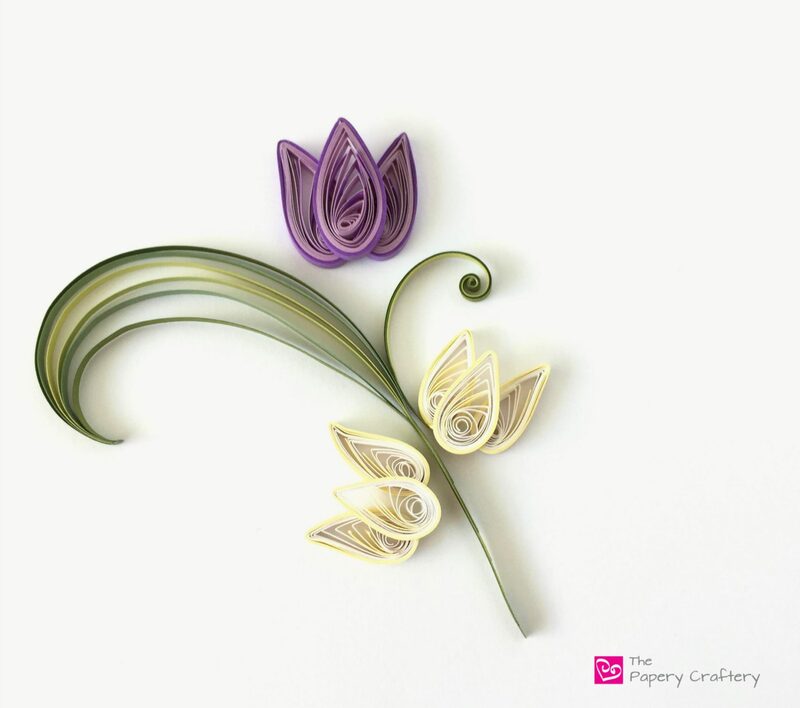 Paper quilling and flowers go hand-in-hand. And what says springtime flowers better than tulips! So, this week, I’m giving a quick tutorial on making simple quilling paper tulips. Plus, I’m pulling in some more examples of ways to use the paper swirls that I was making last week. Double win! Quilling paper tulips are an easy flower for those crafters on the beginner side. No extra tools are needed, beyond the your quilling tool, some glue, and two paper colors of your choice. I chose to use a lavender color and a darker purple. I’m also including some info on working with a quilling circle template workboard. It’s a pretty handy item to have in your quilling tool chest, because it allows you to make even coils. To start the tulips, roll 3 equal length strips on your quilling tool. The length of your strips will decide the ending size of your flowers. I used 3 11″ strips of the lavender and my tulips were about 1 1/2″ across. Once each strip is rolled, remove from your quilling tool, and gently place in one of the circles of your quilling template. The coils will unravel slightly and evenly. After a few minutes, they will have stopped unraveling, and you can glue the end. Form your coils into teardrops. Using a strip of the second color, gently wrap each teardrop 3 times. I do this by gluing the very end of the new strip to the peak of my teardrop, then wrap as much as I want. When I finish with my third go-around, I rip the extra off gently, and glue. I don’t find it necessary to glue the entire way around. Just take care not to mess up that nice teardrop shape you’ve made! Next, make the petals look a bit more tulip-y. Choose one to slightly press into a wider, squat teardrop. The other two, just form into curved teardrops. Now, your quilling paper tulip petals would look perfectly lovely at this point. But, of course, I can’t just leave things simple – I just had to put a new spin on these babies! I decided to add a few bits of the darker purple paper into each petal to add a bit more dimension. I simply glued tiny strips in between the folds in my teardrops to give each petal more of a shadow on one side. It’s pretty subtle, but I like it! To make the actual tulip, place your two curved petal facing away from each other, with a slight space between them. Add a small amount of glue to the inner edges of those petals, and gently lay the last petal on top of both. If you want to make your quilling paper tulips look more or less in bloom, simply adjust the angle and space of the curved petals. In addition to the purple tulips, I also quilled up a bunch of white flowers with cream outlines. Like I mentioned earlier in this post, tulip leaves are a perfect way to incorporate some quilling paper swirls. Using 3 different shades of green, I made a few broad leaves with a slight coil on top, plus a few tendrils on the sides. These quilling paper tulips scream Easter and spring and would be amazing on handmade cards! Leave a comment below and let me know how your tulips turned out! And don’t forget to stop by my brand new quilling basics page to brush up on all your beginner quilling techniques! Awww, thanks so much for the kindness, Andrea! My goal is to make quilling simpler and more accessible. I hope you will try it someday! I know you can do it! This is so neat! Thanks for the tutorial! These are so beautiful! I have always been fascinated by quiling and have wanted to try it. You broke it down so well, I just might feel brave enough to try it! That’s great to hear! Let me know if you have any questions! I am intrigued by this. It is hard to wrap my brain around these techniques and how to use the finished quilling. I enjoy reading you blogs. Thank you, Amanda! Most quilling is framed and used for home decor, or also on greeting cards. But it can be used for all kinds of things. I’ve made a couple posts on how to string them up as garland for the holidays! I have been wanting to try quilling for the longest time, but it looked and sounded so complicated. Your instructions made it super easy. I was able to make several tulips without much difficulty. However, I’m still trying to make the stem. Could you provide some instructions? Thanks. I look forward to future quilling projects. Hi Erin, I’m so glad the tulips are working for you! The broad stems / leaves that are featured with these flowers are just large quilling paper swirls made from two shades of green paper. I have a whole post on making them here. I hope it’s helpful. If you have any more questions, feel free to ask! Muito obrigado pelas suas amáveis palavras! I’m sure you can do this, Corine! Feel free to ask any questions!